This entry got long and all self-reflect-y. There is important stuff at the top, and also about subscribing at the bottom. Feel free to skip the middle. 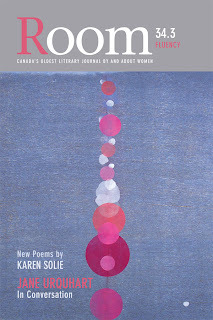 The new Room magazine, Issue 34.3, will be out soon, and my essay “All I Can Say” is in it! Here's the cover. Here's a link to the editor's opening essay, which starts off with my own piece. Nonwriters sometimes ask writers, “How long did it take you to write this story?” To illustrate the difficulty of answering that kind of question, I've created a timeline of events that are (mostly) relevant to this essay. 2000 (May): My mother dies, technically from pneumonia, but really from Alzheimer's Disease. She lived in Oklahoma; I live in Colorado. I had quit writing about my mother's illness during the last year of her life so that I could be more present in it. I take up writing again soon after her death. 2001 (September): I take my first class in American Sign Language (ASL), something from my List,* with a (hearing) interpreter. She (strongly) advises us to take class at the local community college from with Eric, a local Deaf teacher. So I do, in January 2002. 2002 (June 14): Eric's hearing dog Fancy is killed by a drunk driver, and Eric is injured in the accident. Fancy's funeral reminds me strongly of my mother's, though they are also very different. I write a brief piece about Fancy and Eric, in response to a question from Veronica Patterson, a poet and friend. 2003: I continue to study ASL, now in a formal program to prepare interpreters. I work on various essays. Mostly they're about my mother. ** An early pre-version of “All I Can Say” shows up. I do other writing for money. I'm not sure what I'm looking for, either in writing or life. 2004 (August): I recognize that my life isn't working. I leave the interpreting program (the fact of leaving still gives me a pang, though I would not have been a good interpreter) and begin the process of moving to Canada. *** Writing (except for work) takes a back seat to filling out forms and, I guess, life. 2005 (November): I become a permanent resident of Canada and recognize that it's time to get serious about this creative writing thing. I'm not sure what that means, but I do produce words on virtual pages. 2006 (December): I send off a version of this essay; it's rejected. I don't remember doing it, but I trust my Excel spreadsheet. A couple of short nonfiction pieces, one about my mother, appear online in Tiny Lights (http://www.tiny-lights.com/flash.php, the Ninth and Tenth flashes). 2007: A different, longer essay about my mother receives honourable mention in a contest from Riverwalk Journal (March, pub July/August). My father dies (April). I get married (August). 2008: Still writing. My new creative writing is mostly fiction, but "All I Can Say," about Fancy and my mother and Eric, won't leave me alone. 2009: I start submitting writing on a schedule: something, somewhere, every month. Turns out I don't have as much “finished” fiction as I thought I did, and there's this essay, so... I pull it out and revise it. The critique group gives me this title; a writing friend points out an important “show don't tell” toward the end. I send it off to the CBC Literary Awards (October), feeling good about the investment my entry fee represents. 2011: Room accepts it. Now you can read it! So there's your timeline. As you can see, the answer to the "how long?" question often is "oh, a while." And if you also noticed that the "it takes a village" concept sometimes also applies to writing, well then--bonus points for you. I'm pretty happy – make that ecstatic – that this piece found its home in Room, a place where women can write about achievement and sports as well as relationships and feelings. My mother is right at home in its pages. I'm also extremely pleased that this part of this journey has completed this loop of life's ongoing spiral. Many heartfelt thanks to all those who gave feedback along the way. Happy reading! * This List is now known as a "Bucket List," though I don't really like that designation. I'd added ASL to my List in graduate school during my Intro to Linguistics course, not long after meeting a Deaf Master's swimmer in Arkansas. ** There's a long and as-yet-untold story about the drunk driver and various legal shenanigans. It may stay untold, but it ends with a harmonica. *** This is not as "running away to join the circus" as it sounds. My mother was born and grew up here, so I had roots and connections here.